Hurricane Patricia the most intense tropical cyclone ever observed in the Western Hemisphere is comming. Hurricane Patricia became the strongest tropical cyclone ever recorded. Storms with an intensity of 922 hPa (27.23 inHg) or less for only Eastern Pacific Ocean are listed below. The next full moon falls on June 23, 2013 at 11:32 UTC. (US time zones: 4:32 am PDT, 5:32 a.m. MDT, 6:32 a.m. CDT, 7:32 a.m. for other time zones you can click the link to convert 11:32 UTC to your local time and date). This full moon will be called supermoon or super full moon or perigee full moon because of the closest approach of the full moon to the Earth for all of 2013. Supermoon could be up to 30% brighter and 14% larger then at its apogee furthest point. Table below lists supermoon dates between 2010 and 2016. As you can see on May 6, 2012 super full moon was ‘extremely super’. There was only 2 minutes difference between perigee and full moon. 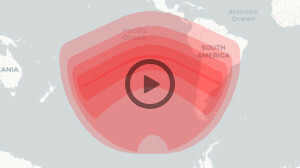 A penumbral lunar eclipse will take place on May 25, 2013. Where the Moon eclipse will be visible? Click the image to enlarge. The eclipse will be visible in the white area, so as you can see, the eclipse will be visible from the Americas and western Africa. What time will 25 May, 2013 Moon eclipse will take place? Note: you can click on the links to see the UTC hours in your local time. See also: Moon Phase Tonight Current or simulated Moon phase, position and Moon parameters such as Moon-Earth distance, illumination, declination etc. World No 3. Agnieszka Radwanska will face Angelique Kerber (8) in the ladies’ semifinals. World No 6. Serena Williams will face Victoria Azarenka (2) in the Wimbledon’s semifinal. Patrick Makau from Kenya brakes men’s marathon world record on Sunday, 25 september 2011 and wins Berlin marathon. He ran 42 km and 195 meters (26.2188 miles) in 2 hours 3 minutes 38 seconds. The previous record was set by Haile Gebrselassie (Ethiopia) in 2008 on the same Berlin course. According to the Albert Einstein theory, speed of light is the Universe’s ultimate speed limit, but an experiment that have been carrying by Dr Ereditato and his team for last three years suggest neutrinos can travel faster then light. measurement of the neutrino baseline, allowed reaching comparable systematic and statistical accuracies. Another big sport competition (except World Championships in Athletics mentioned in the previous post – Current time in Korea) currently being held is US Open – hardcourt tennis tournament which is a part of, so called, Grand Slam. Since 1978 has been played at Flushing Meadows-Corona Park in Queens, New York City, USA. US Open 2011 is scheduled to be played from August 29 to September 11, 2011. Look at the below visualisation of the situation in FIFA 2010 World Cup’s Group C before last phase of the group stage. 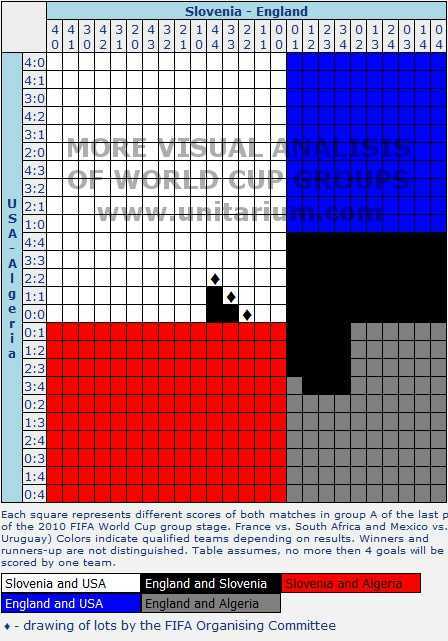 Each square of the drawing represents different result of the both last matches in group C (England vs. Slovenia and USA vs. Algeria) and colors on the drawing tell us who will be qualified to the next round. Black, blue and gray squares indicate that England will be qualified. As you can see, if they win against Slovenia a least 1:0, they will be qualified to the next round. There are also some cases in which England will advance, if they draw the match (black squares in the middle of the drawing). There are also three pairs of interesting results (USA – Algeria 2:2,1:1,0:0 and England – Slovenia 1:1,2:2,3:3) marked by the black diamonds. In this case both teams have same number of points (3), same number of goals (3,4 or 5 depending on the result) and same number of goals scored in match between USA and England. Due to the terms of FIFA World Cup, drawing of lots will be needed to find the winner.